KUALA LUMPUR (Feb 27): Malaysia’s ringgit fell, leading a decline in Asian currencies, after U.S. inflation data that beat estimates bolstered the case for the Federal Reserve to raise interest rates. The U.S. central bank has focused on jobs numbers and inflation figures to judge the timing of its first rate increase since 2006. Fed Chair Janet Yellen signaled this week that any tightening will likely take place in the second half. The consumer-price index excluding food and energy rose 0.2 percent in January from the previous month, more than the 0.1 percent forecast in a Bloomberg survey and spurring a 0.9 percent advance in a gauge of the greenback overnight. The ringgit fell 0.8 percent to 3.6115 a dollar as of 10:30 a.m. in Kuala Lumpur, the biggest drop in more than a week, data compiled by Bloomberg show. The currency climbed 0.5 percent in February. 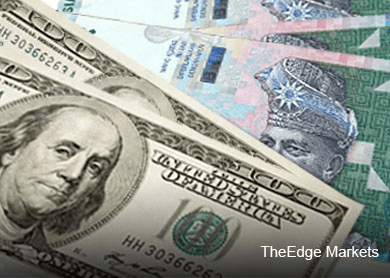 The ringgit gained in February after falling for the past five months as a rebound in crude eased concern that revenue will drop in the oil-exporting nation. Brent rallied 15 percent in February, halting a seven-month decline, while an agreement over Greece funding with the euro region helped boost sentiment for emerging-market assets. Oil contributed 30 percent to Malaysian revenue last year, compared with just over 35 percent in 2010, Idris Jala, minister in the Prime Minister’s Department, said in a statement Thursday. The nation is well-positioned to face uncertainties as it has a well-capitalized banking system and developed financial markets, he said. Gross domestic product increased 6 percent last year, compared with 4.7 percent in 2013, and exceeding the 5.9 percent forecast in a Bloomberg survey, a Feb. 12 report showed. Government bonds climbed this month. The yield on five-year debt declined five basis points, or 0.05 percentage point, to 3.64 percent, according to data compiled by Bloomberg. It retreated nine basis points in the past five days and was steady Friday.